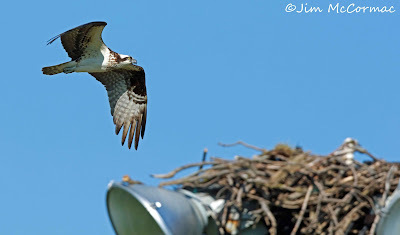 House Sparrows nest in Osprey nest! 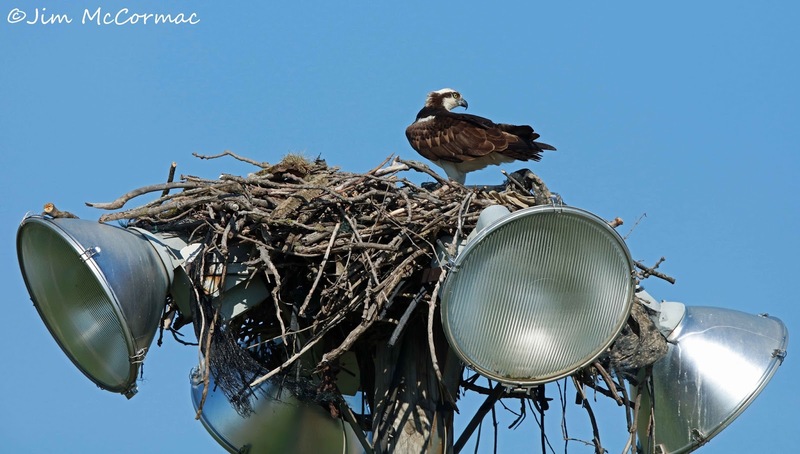 An Osprey wheels protectively over its nest, while the female is on the nest, incubating a clutch of eggs. 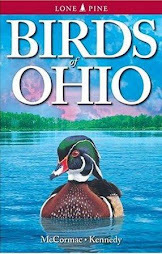 While on a whirlwind birding tour of central Ohio on April 16, Bernie Master and I stopped by Scioto Audubon Metro Park just south of downtown Columbus. 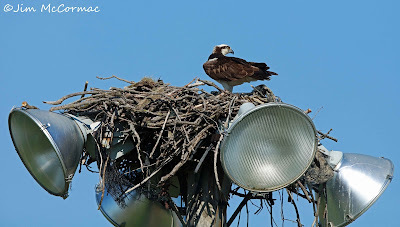 We spent a few minutes admiring the Ospreys, which are nesting atop a light pole, just as conspicuous as could be. While making photos of the birds, I noticed something odd and unusual - House Sparrows were apparently nesting within the Osprey nest! I resolved to return when time was more plentiful and document this excellent case of commensalism (relationship between two organisms, where one benefits and the other is unaffected). That day was last Saturday, in the perfect light of late afternoon. An Osprey glares around from atop its aerie. The birds are quite protective. At one point, a Red-tailed Hawk flew past, and both birds rose to warn it off. But they are quite unconcerned with people. This is a high-use park and many people are everywhere, often quite near the nest. It doesn't seem to bother the "fish hawks". If you are looking for a great place to practice in-flight photography on an easy, relatively slow moving subject, this is your chance. 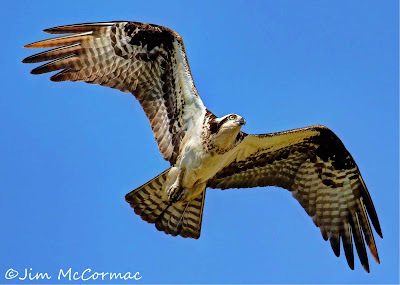 Plus, Ospreys are just cool to watch. 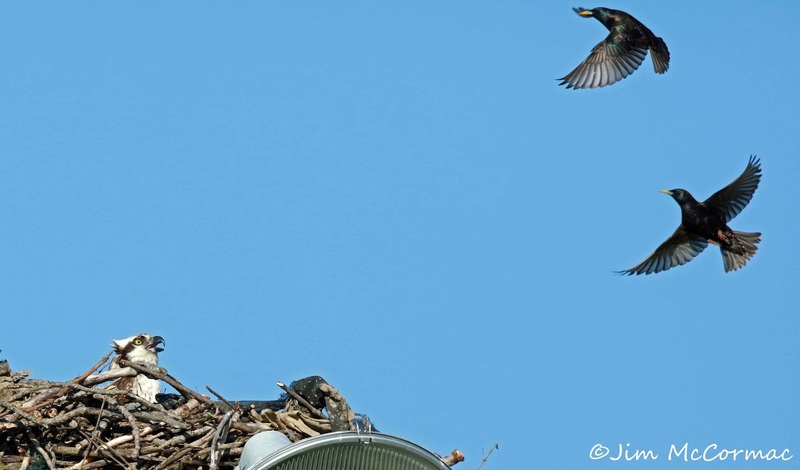 These European Starlings invoked a stern rebuke from the incubating Osprey. I saw this happen several times. 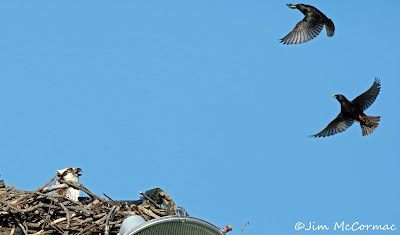 A small flock of starlings would sail in towards the nest, no doubt thinking it a good roosting spot. As they dropped in, they'd spot the Osprey at the last instant, which would scold them with piping whistles and send the invaders packing. Icy stares and stern rebukes have done nothing to dissuade plucky House Sparrows from thoroughly taking advantage of this Osprey nest. A male sparrow perches atop one of the lights, no doubt pleased with his cleverness and utterly unconcerned by the massive bird of prey glaring at him from a few feet away (look carefully at top right of nest). 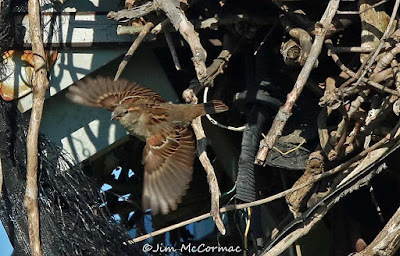 The male sparrow brings in a load of dried vegetation to add to the nest. His mate can be seen to the right, hiding amongst the sticks. This is the entrance portal, on the west side of the Osprey nest. The sparrows would disappear completely into the bulky stick nest, and I suspect their nest is deep within the structure, likely only inches below the floor where the Osprey's eggs - and chicks to be - are located. While the Ospreys are totally aware of these interlopers, and probably less than pleased about the unwanted arrangement, there's nothing that they can do about it. 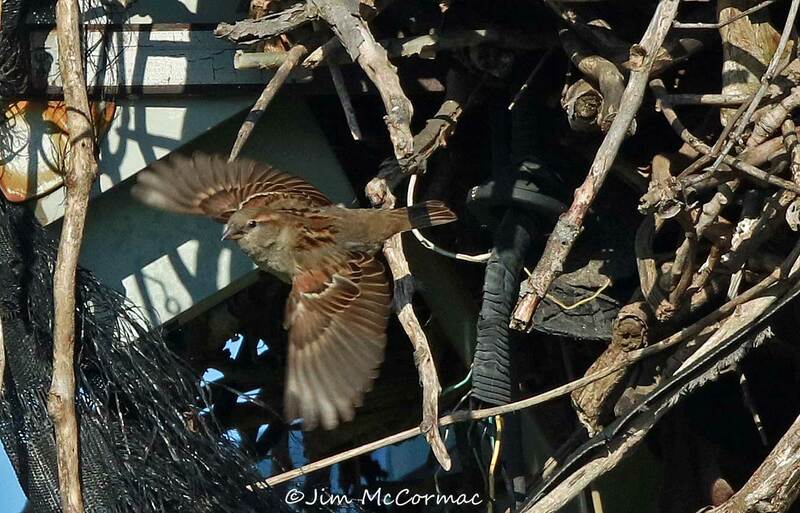 The female House Sparrow darts from the nest, having been spelled by the male. Judging from their behavior, I'd say the sparrows are incubating eggs, just like their much larger hosts. Say what you will about House Sparrows, but they are good parents. Males take on much of the nesting duties, including nest construction, incubation of eggs, and feeding of chicks. While House Sparrows have been recorded nesting within large raptor stick nests before - even Bald Eagles! - it is still cool to see firsthand. And thoroughly document with photos. 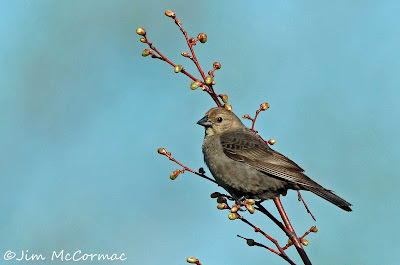 Several times, a female Brown-headed Cowbird (or likely the same one) perched for an extended period in a small tree very near the Osprey nest. I have little doubt that she was keeping tabs on the House Sparrow activity. Cowbirds, as you likely know, are nest parasites - the female lays an egg in a host species' nest, leaving the unwitting parents to feed and raise the cowbird chick. Cowbirds are known to parasitize House Sparrow nests, too. I really was wishing that she'd gotten her opening and darted up and into the sparrow nest. I'd have loved to have made photos of that! But House Sparrows are quite protective of their nests and the cowbird never got an opening, at least while I was there. Less than no time for proper blogging of late, between travels, talks, preparing for travels and talks, and myriad other things. So, a briefly captioned photo montage from last weekend's forays in central and southern Ohio follows. A gorgeous rose-pink form of Shooting-star, Dodecatheon meadia, at Miller State Nature Preserve in Highland County. When seen well, the tiny flowers of Miterwort, Mitella diphylla, resemble snowflakes. Miller State Nature Preserve in Highland County. A tiny fly taps nectar from Star Chickweed, Stellaria pubera, and presumably provides pollination services. 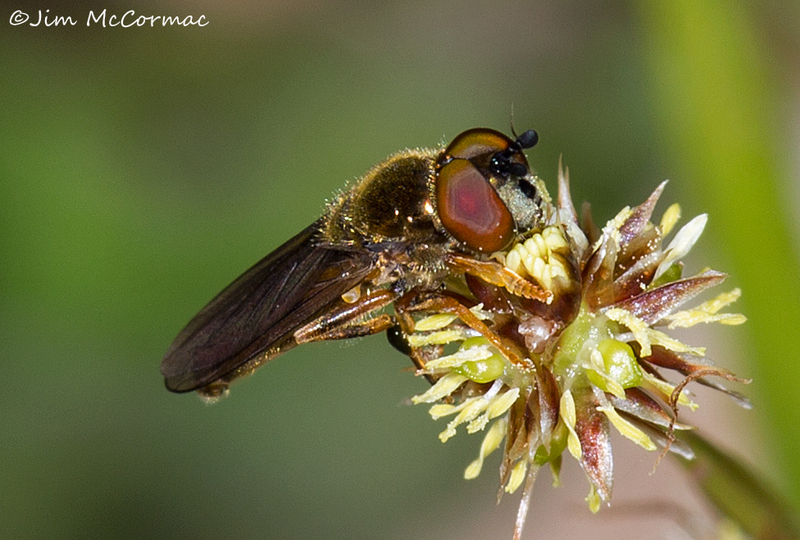 I do not know the fly's species, but there were many of them working the spring wildflowers. Native flies are enormously important in plant pollination. Miller State Nature Preserve in Highland County. One of the smallest and rarest of Ohio's approximately 30 violet species, the Walter's Violet, Viola walteri, which is listed as threatened in the state. The entire plant would fit on a 50 cent piece. Adams County. A gorgeous, diminutive member of the iris family, Pale Blue-eyed-grass, Sisyrinchium albidum. Adams County. A close ally to Dutchman's-breeches is this Squirrel-corn, Dicentra canadensis. Adams County. A stunning native solitary bee (unsure of species) pollinates Wild Hyacinth, Camassia scilloides. Adams County. For all of their bad rap, mosquitoes also do good. This one taps nectar from a rare Ohio plant, the False Garlic, Nothoscordum bivalve (threatened). Judging by the pollen adhering to its leg, the mosquito helps pollinate, too. Adams County. A young Great Horned Owl, only days from the nest, tries to become one with the cones of a European Larch, Larix decidua. 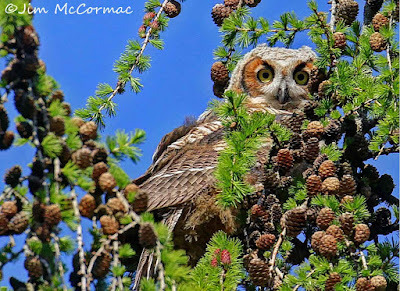 Its nestmate was nearby, and mother owl as well. Franklin County. An Osprey swoops into its nest at Scioto Audubon Metro Park near downtown Columbus. 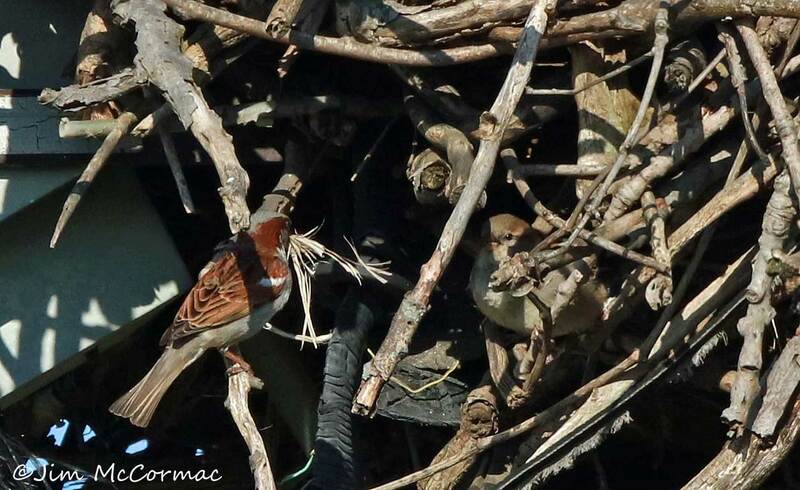 I was interested to note that House Sparrows are nesting within the Osprey nest. An Eastern Cottontail gambols through a meadow at Stage's Pond State Nature Preserve in Pickaway County. The beautiful spring day had him all hopped up. You may be pleased to know that the Thirteen-lined Ground Squirrels have arisen! These prairie dog relatives go underground in fall, and don't emerge until April, spending winter in a state of extreme hibernation. A Pickaway County colony was active on this day, with squirrels busily attending to various tasks. An Osprey from the aforementioned nest soars overhead, showing its classic M-shaped wing posture. Hope you're enjoying spring as much as I am! OSU Museum of Biological Diversity - Open House! This Saturday marks the 12th annual open house at the Ohio State University's Museum of Biological Diversity. You won't want to miss it. This is a rare opportunity to see fascinating collections that are normally inaccessible to the public. Hours are 10 am - 4 pm, and all the details are RIGHT HERE. About 50,000 people lived in Ohio in 1803, the year it became a state. They were greatly outnumbered by prairie chickens. Two centuries ago, Ohio was far wilder than it is today. Most of the state was forested, but interspersed were vast prairies — about 1,500 square miles at the time of settlement. Prairie regions blanketed vast swaths west of Columbus, south of Circleville, and in the Marion area. Noteworthy was the Oak Openings, a 300-square-mile mosaic of savannas and sandy prairie west of Toledo. The prairies were exceptionally diverse in both flora and fauna. 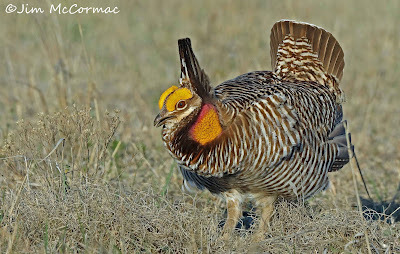 A standout among the prairie denizens was the greater prairie chicken. Prairie chickens are related to wild turkeys and ruffed grouse, but they shun the forests preferred by those species. The treeless oceans of grasses and myriad sun-loving prairie plants are where the chickens roamed. No one knows how many prairie chickens occupied Ohio in the early days. Vague settler accounts from the early 1800s cite “thousands” of prairie chickens in the larger prairies. 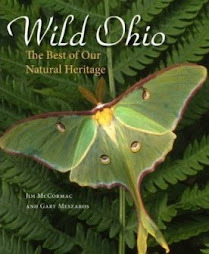 They were undoubtedly a large part of Ohio’s prairie ecosystem. By 1837, Ohio’s population had burgeoned to 1.5 million people. That year, a Vermonter turned Illinoisan named John Deere launched his steel chisel plow. The prairies would never be the same. Deere’s device gave settlers a tool to cut thick prairie sod, and almost overnight, Ohio’s rich prairie was transformed into seas of crops. Bolstered by agricultural and industrial advances, Ohio’s population passed 4 million people by 1900. Not coincidentally, that’s about when prairie chickens vanished from the state, unable to compete with the onrushing tide of humans. I recently traveled to central Kansas to see and photograph prairie chickens, courtesy of Jackie Augustine of Ohio State University's Lima branch, who studies chickens in the Sunflower State. Geoff Gould, one of Jackie’s doctoral students, escorted me to a blind on the edge of a prairie chicken lek, or dancing ground. After getting the lay of the land, I returned before sunrise the following morning. As dawn cracked the horizon, the eerie whistled hoots of male prairie chickens began. Their mournful three-noted dirges were accompanied by frenzied squawks and clucks as the males jostled and sparred. Shadowy silhouettes morphed into glorious prairie chickens, illuminated by a gorgeous sunrise. The males gather on leks to court females. Strutting their stuff, they inflate air sacs on the neck that resemble egg yolks to create their telltale booming whistles. The much plainer females strolled about, seemingly ignoring the pompous antics of the males. They’re sizing up prospective mates, though — the alpha male is likely to mate with almost all the hens, while lesser males might not get any girls. Greater prairie chickens now occupy but a shadow of their former range. Fortunately, there are still places where they thrive, and I am grateful to have experienced the magic of a chicken lek in its full glory. Spring is said to advance northward at a clip of about 16 miles a day. So take heart, ye tundra-people of Cleveland and other points north - you'll get some floriferous action soon enough. The plants are really popping in southernmost Ohio, and the evidence follows in pictorial form. I was roaming throughout Adams and Scioto counties - Ohio River counties - last Sunday, where I made these images. I was deep in Shawnee State Forest bright and early, hoping to create some bird images. The 29 F temperature kept the feathered crowd fairly inactive, though. As the sun gradually warmed things a bit, activity increased. There were plenty of kinglets, both Ruby-crowned (above) and Golden-crowned. Louisiana Waterthrushes were back in force, as were Yellow-throated Warblers. Pine Warblers were on territory, and a smattering of Black-and-white Warblers and Blue-gray Gnatcatchers were back as well. I also heard the first Broad-winged Hawk of the season (for me). However, I pointed the lens at flowers, mostly. This is not a native, I know, but Colt's-foot, Tussilago farfara, is a showstopper when looked at in this way. This Eurasian weed of rocky roadsides and embankments is very early to flower, and was nearly done. A beautiful clump of Twisted Sedge, Carex torta, graces a small stream in Scioto County. Sedges in the genus Carex are easily the largest group, by genus, of Ohio plants with over 160 species. They are extremely important ecologically, even if few people can identify most of them. 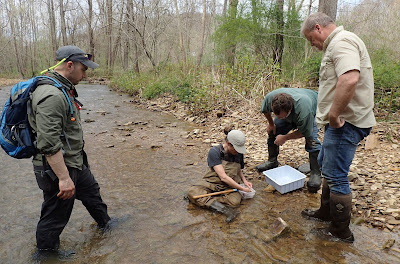 Twisted Sedge is vital to streamside ecology; it stabilizes gravel bars and streambanks. The dark spikes are the staminate (male) flowers, the pistillate (female) flowers are greenish, more elongate, and droop below the staminate flowers. A vertical limestone cliff face along the Ohio River in Adams County was liberally draped with this showiest of native vines, the Cross-vine, Bignonia capreolata. You may be more familiar with its close relative, Trumpet-creeper, Campsis radicans. The delicate little Common Woodrush, Luzula multiflora, was beginning to bloom everywhere, and I noticed a few of these flies habitually visiting the flowers. This was interesting to me, as conventional wisdom states that most members of the Rush Family (Juncaceae) are wind-pollinated. These monocotyledonous plants have very simple flowers, devoid of the gaudiness often associated with entomophilous flowers (those that need to attract insect pollinators). Yet these little flies were working over the woodrush blooms, and one can see the pollen sticking to the insect in this photo. Speaking of gaudy flowers, here's one, the Bird's-foot Violet, Viola pedata. It was just beginning to bloom, and visitors to Shawnee State Forest this weekend and the next should find it in good form. This is the antithesis of a gaudy flower, even though it belongs to a family revered for its showiness. It is Mousetail, Myosurus minimus, a member of the Buttercup Family (Ranunculaceae). It's in full bloom. The elongate green spikes are the fruit. Tiny whitish petals can be seen at the base of some of the fruit stalks - those are the flowers. Mousetail is a curious plant that in Ohio is known from only a few low-lying, vernally saturated pools in fields along big rivers (the Ohio River, in this case). I was pleased to find this beautiful wild onion in flower near the village of Manchester in Adams County. 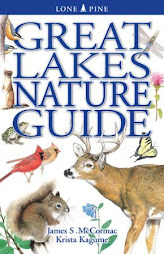 It is known as False Garlic, Nothoscordum bivalve, and it is listed as threatened in Ohio. There is a smattering of populations in the general area of Adams County where I made this image, and a rather distant site in Clark County. I finished the day at a spectacular wooded slope along the Ohio River just west of Manchester. 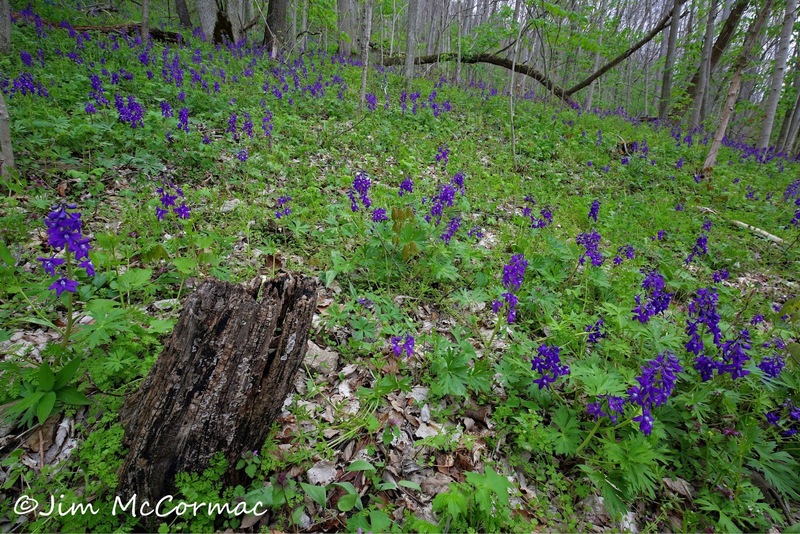 The Dwarf Larkspur, Delphinium exaltatum, was at peak and painted the hillside purple. 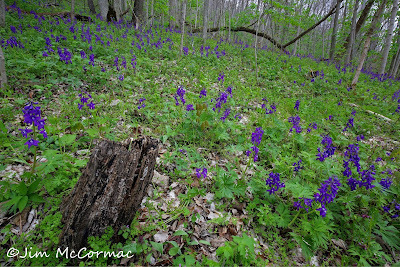 Many other species of wildflower accompanied it, but the larkspur overpowered all comers. This species, by the way, is in the same family as the aforementioned Mousetail. Given Homo sapiens' general propensity for showy superficiality, I suspect most would prefer gaping at the scene above than wallowing in muddy fields scouring about for tiny and obscure Mousetails, and I suppose they couldn't be blamed. 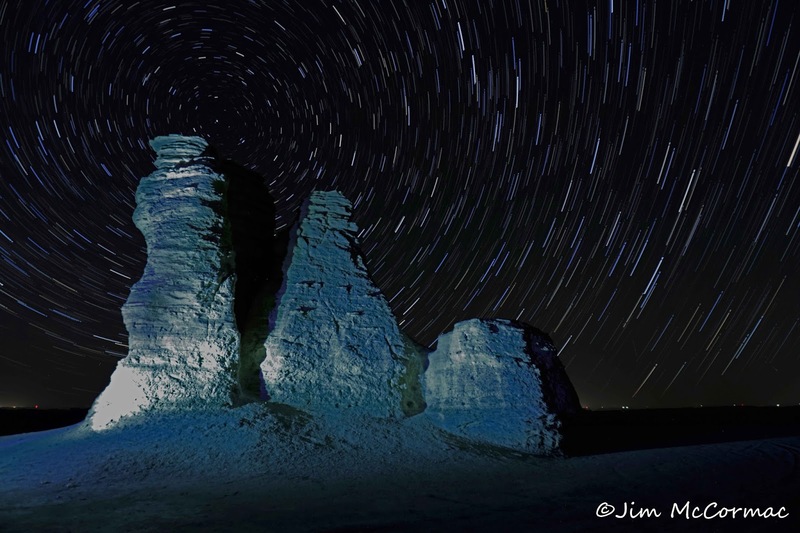 The stars appear to orbit Castle Rock in west-central Kansas. A 20-minute exposure reveals the earth's rotation, creating the star trails. It was nice to be in a locale with very little light pollution. Still haven't had time to wade through all my Kansas photos, and separate the wheat from the chaff. There is some wheat, though, and I will share some of those images soon enough. I returned LATE last night from a whirlwind trip to Kansas. The expedition was filled with fascinating sites, noteworthy observations, and pixels and pixels of pictures. I'll be sorting, editing, and deleting for a while. The main focus of the trip was prairie-chickens, and on that score it was phenomenally successful. More on those later. For new, here are a few of the many species of birds that were seen. 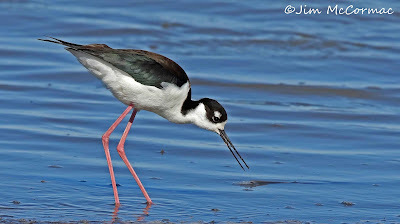 The oddly elegant Black-necked Stilts were just beginning to arrive at Cheyenne Bottoms Wildlife Area in Kansas. This one was photographed last Saturday. 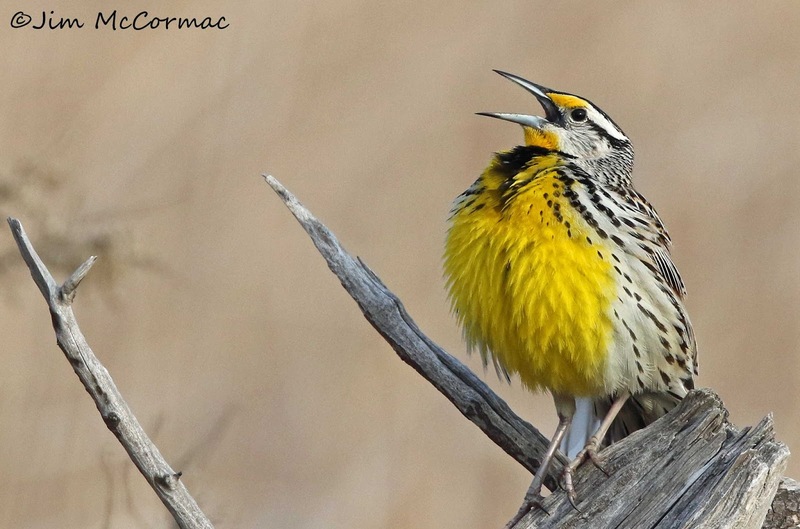 The clear, ringing whistles of Eastern Meadowlarks provided a tuneful soundscape in Kansas. At this locale, at Quivira National Wildlife Refuge, nearly all were Easterns. About an hour to the west, nearly all were Western Meadowlarks. 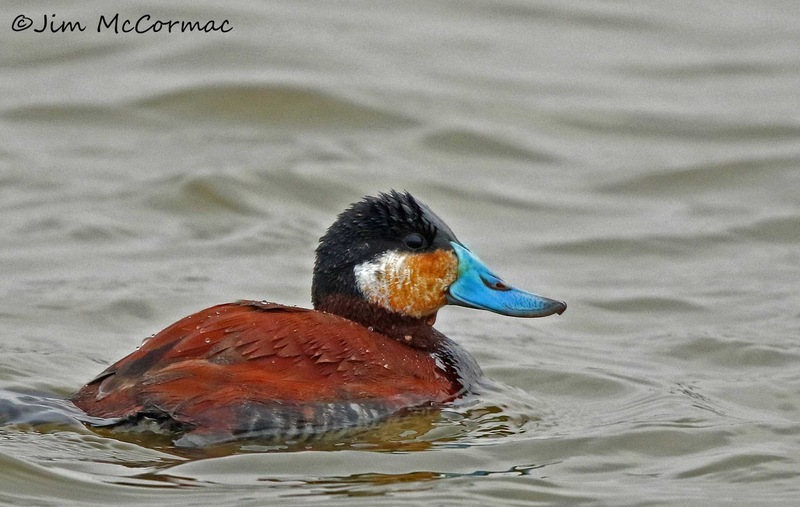 Some of the male Ruddy Ducks at Quivira National Wildlife Refuge have acquired their resplendent plumage of chestnut. The powder-blue bill is a nice touch, although his white cheeks are marred by some sort of iron oxide staining. This one was imaged last Wednesday.